John Benedict was born in the middle of the 20th Century to Harold and Wanda Benedict. His loving parents supported an inner drive for self-expression, not only for him, but for his brother Jim and sister Gail as well. Each has pursued different avenues of artistic expression. His brother, Jim, went on to become an accomplished infrared, black-and-white film, natural landscape photographer. His sister, Gail, has dazzled audiences on the Broadway Stage (New York) and international stages as a singer, dancer, choreographer, and, in more recent times, as a blossoming song writer and playwright. John's journey of self-expression began at the age eight when his father gave him his first set of wood tools, including a small electric jig saw. From that point on he was literally "off to the races" building adventure toys such as "soapbox" racers that plummeted down the steep hills of the San Francisco Bay Area without brakes, and rubber band guns (with triggers that actually worked) for all the neighborhood kids. It was not long before John realized that he would spend a lifetime tempted by the sights and sounds of sailing the open ocean. Yet, at the same time, he was drawn to the splendor and tranquility of the high country. When he set foot upon the decks of historic sailing ships at various ports around the United States, or gazed upon photographs of ships such as the H.M.S. Victory, he was "home"... he knew he belonged there.... that he had always been there. He has long felt that he was a sailor, and even a shipwright, in some long ago, previously forgotten lifetime. Yet, again, while sitting at the top of a mountain pass in the Sierra Nevada Mountains with his brother Jim, after being out for weeks, John felt equally at home there too. Opportunities to sail never came about in his young life, so he turned to building ship art. John's first carved ship was the "Sea Venture" at the age of 12. His first reasonable attempt at a plank-on frame ship came a couple of years later after his Uncle Robert taught him the necessary skills of framing and planking at his carpenter shop in Storm Lake, Iowa. Uncle Robert was building an actual 50-foot sailing yacht out of oak and teak in his backyard, and had made his own scale model of that yacht. Throughout his teenage years, John lived in the boat shop he created in his father's garage; departing to only attend school, and to head for prolonged backpack trips with his brother Jim. While in the shop, John yearned for the mountains; while in the mountains, John yearned for the shop. John pursued other forms of art training and practices, but always retuned to ship building. By the time he was 18, he blended his need for the mountains and his love for water into a passion for whitewater rivers. 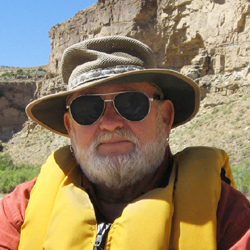 He spent five years as a professional river guide while attending the College of San Mateo, Oregon State and University and U.C. Berkeley for a B.S. Degree in Forestry; always returning to his shop to build ships during his spare time. John has long admitted that in his college years he "majored" in river running and "minored" in Forestry. It was, in fact, his river experience that got him employed with the federal government as a Professional Recreation Planner. After 30 years of public service, John returned to "private life" in 2006. He retains that life-long inner turmoil to be in both the shop and in the mountains (or on some river) at thre same time. This turmoil has now been intensified with his attention to the ceramic arts and now, most recently, graphic oil painting. John shares his passion for ceramics with his wife, Teresa Nebeker, who he met in 2003. She is the pottery "thrower" or "turner" in the family while John most enjoys painting and carving on Teresa's art pieces. John prefers the "flat work" (tile) and figure carving. Teresa spent years enjoying the collecting of antique pottery before she met John. It was necesaary for John to install a very large display area in their home. John encouraged Teresa to create her own pottery rather than just admire the works of others and, thus, the journey of ceramic art creations began for both of them. She now creates her own future antiques with John's assistance. Also, Teresa is now venturing into the lapidary arts with John's assistance. In 2008, John ventured into the realm of oil painting (which he calls "graphic oils") to protray the images of mountains and rivers stored within himself. Each painting is the expression or remembrance of beautiful places he once visited or dreamed about. As such, his work in oils is truly the expression of his soul tempered by the need to retain the exactness of images he carries in his mind and produces with his hands. Jim graduated from the School of Forestry and Conservation at the University of California, Berkeley with a degree in Recreation Management. In 1973, he was recruited by the National Park Service as a Research Assistant and later as a Research Biologist in Yosemite National Park. He worked briefly with the U.S. Forest Service while pursuing his Master�s Degree at the School of Forestry at the University of Montana in Missoula where he obtained a degree in Forestry. His long and committed career with the National Park Service took him to Yosemite National Park, Grand Teton National Park, Voyageurs National Park, Denali National Park and Preserve, Santa Monica Mountains National Recreation Area and Virgin Islands National Park where he was instrumental in developing several NEPA documents that will reduce feral animal populations and help preserve the terrestrial environment of the park.� During the course of his career, he prepared dozens of major planning documents and co-authored publications on fire behavior and prescriptions, backcountry management, and vegetation mapping for journals. Almost his entire working career of 30 years was with the National Park Service where he dedicated his life to protection of the natural environment. There is no doubt that he would have continued this lifelong commitment to preservation, if illness had not gotten in the way and taken him at age 61. As a researcher and resource manager, his job was to consider the consequences of human actions on the environment: water resources and forests; biology; fisheries; recreational and camping opportunities, and the impact of exotic plants and animals on the environment. He was never a man of many words. 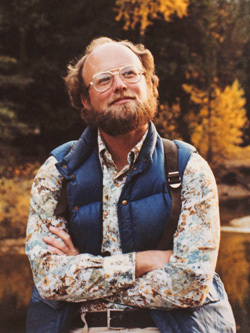 He calmly and passionately devoted his hours to seeking the �truth.� When he did the tedious work of preparing dozens of public environment documents, his visionary direction impacted the administration of park programs and his early work on fire behavior, backcountry management and vegetation mapping paved the way for practices utilized today. He backpacked throughout the west; perhaps thousands of miles, walking and thinking throughout the Sierra Nevada Mountains, the coastal ranges of California, and the southern alps of New Zealand. His friends that sometimes accompanied him, referred to his backpacking trips as �death marches.� He had a life-long passion for ice cream and See�s Candy and his favorite backpacking food was a cookie called Mystic Mints. He was seldom without a camera, and his self-taught, award-winning black and white infrared landscape photography depicted an environment instilled with peace, solitude and harmony. Above all, he was a man that went the extra mile all of his working lifetime committed to an ideal fostered by his career with the National Park Service and his lifelong commitment to the environment.